A twist on the classic Italian sauce of creamy pine nuts, garlic and basil. This Dairy-free recipe uses preserved lemons to replicate the umami of Parmesan. Pesto is an Italian sauce made by blending together basil leaves, pine nuts, Parmesan cheese, garlic and lemon with extra virgin olive oil. Traditionally this was done using the pounding action of a pestle and mortar, although these days we can make use of food processors to grind the ingredients into uniform pieces. This creates a vibrant green paste that is fresh with the tart juice from the lemon, creamy from the pine nuts, and has that satisfying umami sensation from aged Parmesan cheese. 02. 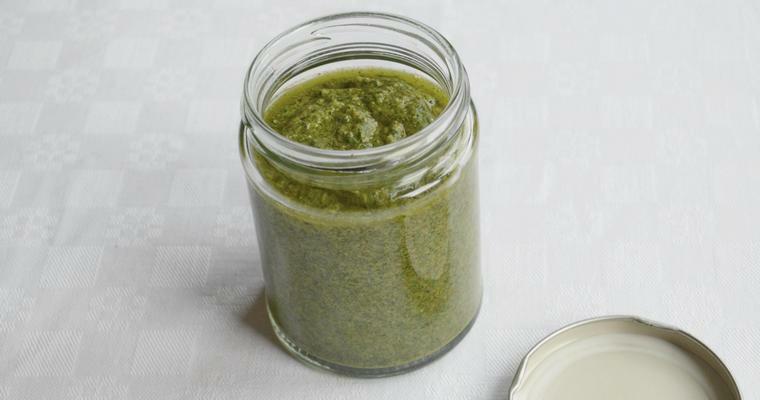 Can you make a convincing pesto without Parmesan cheese? Umami is one of the five basic tastes, together with bitter, salty, sour and sweet. Parmesan cheese has umami in spades, and is often used as the exemplar when trying to describe the sensation of umami. Umami is usually described as ‘meaty’ or ‘savoury’. It is found in fresh foods like black olives, mushrooms, tomatoes, seaweed, anchovies and hung meat, and in aged and fermented foods like balsamic vinegar, miso, nutritional yeast, soy sauce, blue cheese, fish sauce and cured meats. If you remove Parmesan from pesto then you need to replace it with another umami-rich ingredient. Adding black olives or sundried tomatoes would be authentic to Italian cuisine, and declisious, but would fundamentally alter the taste and appearance. Instead, this recipe uses preserved lemons to recreate the same balance of flavours. 03. What are preserved lemons? Preserved lemons are lemons that have been pickled in a brine of lemon juice and salt, and then left to age for at least 3 months in a process called lacto-fermentation. Preserved lemons add a depth of flavour to dishes than cannot be achieved by just using finely grated lemon zest. The preserving process concentrates the lemony flavour, but removes the mouth-puckering sourness that usually accompanies it. As the lemons age, the flavour changes and develops umami. 04. Can I make other ingredient swaps? Strictly speaking, ‘pesto’ just means pounded, and there is no definitive recipe. It describes a generic sauce that can be adapted according to what is available, or to personal taste. If basil is out of season, then you can use other soft-leaved herbs like coriander, mint, parsley, sage and tarragon, or even salad leaves like rocket, spinach and watercress. You can substitute pine nuts with the same weight of any other nut that you think will complement your dish. My favourite is walnuts, for a slightly bitter taste. But you can use pecans or pistachios for a sweeter taste, and cashew nuts or almonds for a subtler taste. Just make sure that you keep approximately the same ratio of greens and nuts, and do not remove the brightening lemon juice or rich extra virgin olive oil. 05. What dishes can I use pesto in? Heat a dry frying pan over a medium heat. Add the pine nuts and just lightly toast – if they start to brown, you’ve over-toasted them (but don’t worry – you’ll simply be adding a nuttier taste to your pesto!). Scrape away and discard the pulp from the preserved lemon, so you’re left with just the rind. Rinse to remove any excess salt. Put the preserved lemon rind, pine nuts, basil, olive oil and garlic into a food processor, and blitz until mostly smooth (if you do not have a food processor, then use a pestle and mortar). Taste, and season with salt, pepper and lemon juice. Mix well and taste again, adjusting the seasoning if necessary. Add more lemon juice if you want a fresher taste, for example if you are pairing with oily fish. Transfer the paste to a sterilised glass jar, using the back of a spoon to press the mixture down and eliminate air bubbles. Seal, and transfer to the refrigerator. For best results, eat within 2 weeks. If storing for longer, pour a layer of olive over the top until the paste is fully covered.